Writing lessons for Gynzy makes me feel I’m part of something big. My brother started working for IBM in the 60’s and looking back on that time, I can’t believe he got to be part of something so world changing. For me right now, writing lessons for Gynzy feels as electrifying as that felt for him. This company is so inventive that even though I’m daily interacting with their website as I create new teacher friendly lessons. I can’t even keep up with all the ingenious tools that are being slapped up there like hot cakes. 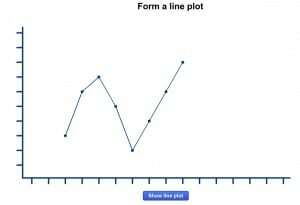 Take for instance, their new plot and line graph tool. It’s amazing! 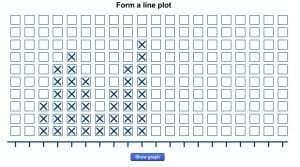 You could do a classroom survey, have students mark their choices on the grid and then click the button and turn it into a plotted line graph. Since line graphs are great for seeing growth over time, you could do a daily question and see how the results are affected over a month or a quarter. This would be great to use during an election. You could study how the media influences our opinions. Teaching the automaticity of times tables takes a lot of time, but the times tables tool allows you to choose which fact families you will use, as well as the speed the questions change. I love the new student accounts and this means you can set the activity individually for students to work on. 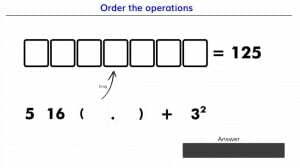 Think of what you can do with all the time you save by using their new Order of Operations lesson for 8th grade! It’s all cooked up for you, hot off the griddle, with a lesson and practice questions all ready to go. You might just be able to actually swallow down your morning cup of coffee with the extra time this handy lesson saves you. When I first started using Gynzy, I didn’t realize how easy it was to create my own lessons. Now that I’m familiar with the tools, I love managing my own electronic file cabinets that store personalized lessons ready to go at a moment’s notice. I can take a great lesson off the site, and customize it for the specific needs of my classroom and then save it without any classroom clutter for next year. It’s downright smart, I think, to grab a lesson that some programming genius spent weeks creating and adapt its fabulous components for an upcoming observation lesson. I have a folder just reserved for templates I’ve snagged from various Gynzy lessons to start me off. One of my favorite folders holds review games that I can customize with my own content. Tools in this folder are the tools Wheel of Fortune, Create your own Memory Game and the Dice activity. I also created my own game boards and Sudoko game. If Gynzy does for the education what IBM did for the Silicon Valley, then I’m getting in on the ground floor. I’m not sure buying stock is an option, but we can explore the innovative tools and lessons while enjoying our morning coffee. Gynzy just gave us the extra five minutes we need to do it.